Following on from the previous Post (Blue for the Pineapple…). I now want to introduce the Anti-Pineapple! Your probably asking the question “How do you create an Anti-Pineapple?” The answer is quite simple; by conducting a review of the security measures installed on the Pineapple device itself; it should be quite easy to create a list of possible scenarios and counter-measures. By analysing the source-code, it becomes immediately obvious that there is no defensive code, no input validation, and for a Web-Application there is no session security, or cross site request forgery protection. Now, readers/developers familiar with PHP and code reviews will know this use of the $_SERVER[php_self] tag is vulnerable to Cross Site Scripting (XSS) as it uses the entire URL specified by the user. 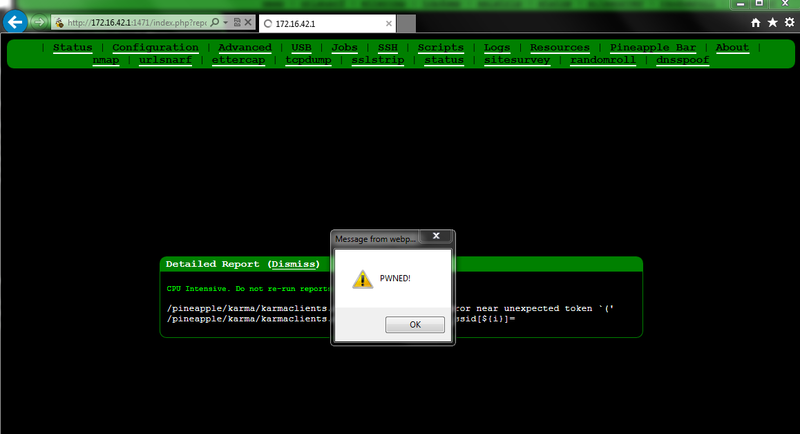 So by simply adding XSS into the URL, the PHP will execute our injected code on the POST-back. As the code has been copied and pasted several times (used as a template) and community developers have copied chunks of the code for their plugins, insecure variables and functions are repeatedly used throughout the code. This is nothing new, as security testers often do not code defensively or securely when their releasing Proof of Concepts (PoCs). As the majority of the community appear to be students or fresh post-graduates, security is most likely something was not necessarily taught to them when they started to learn programming. So knowing data is not validated! How can we exploit this to inject our own code…. if you know how its quite simple? The pineapple is essentially its own device, and when clients associate they are connected to the pineapples private local network (not necessarily with internet access). A user knowingly connected to a pineapple could browse to the Pineapple web interface http://172.16.42.1:1471 and start messing with the configuration (assuming the default credentials root:pineapplesareyummy have not been changed). But this is rather a manual process… there must be an automatic way of attacking the Pineapple…… And what if a clever user has changed the default username and/or password? Read on….. The following section can only be conducted from a Linux or similar UNIX based Operating System (including some Android Smart Phones). The advanced page pages/advanced.php has a handy “execute command” function, by posting the following command via CSRF we are erasing the memory and rebooting the device. When its rebooting there is no memory to reboot, thus effectively rendering the Pineapple device into a brick! Where is the Anti-Pineapple Code? As the Anti-Pineapple PoC code is destructive to current Pineapple Owners, we have decided not to release any public exploit code. We would like to confess that only 1x poor Pineapple was harmed during our research/experiment. Note: We were able to re-flash the firmware, and bring our little Pineapple back into operation. If you want to build the Anti-Pineapple, there should be enough information in this blog post for you to create your own, or even an Anti-Pineapple Infusion 🙂 .